Federal N.D.P. 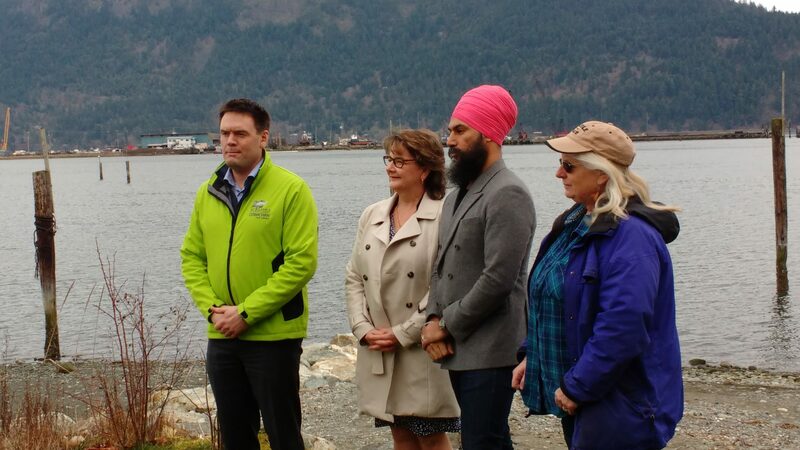 leader, Jagmeet Singh is touring Vancouver Island and made a stop in Cowichan Bay. The New Democrats mandate as the official opposition is to hold the Trudeau Government accountable and Singh referenced the threat the Prime Minister issued at a town hall in Nanaimo. Singh says the Oceans Protection Plan is meant to provide specific protections of, among others species, the resident killer whale populations, which are dangerously low due to a lack of salmon. It also protects oceans by recognizing the impacts of human activity, pollutants, and the dangers industry poses to coastal waters. Singh says the Trudeau Government is using the issue of ocean protection as leverage. Singh, Cowichan-Malahat-Langford M.P., Alistair MacGregor, C.V.R.D. Director, Lori Iannidinardo, and Genevieve Singleton with the Cowichan Valley Naturalists addressed a small crowd at Hecate Park.